NöjesNomaderna offers entertainment concisting of exclusive artists and/or bands for different kinds of events. Our area of expertise is roots music – country, blues, rhythm´n blues, rockabilly etc. When needed NöjesNomaderna has the possibility to take care of all the arrangements such as marketing, soundreinforcement, lights and all things needed to carry out a successful event. 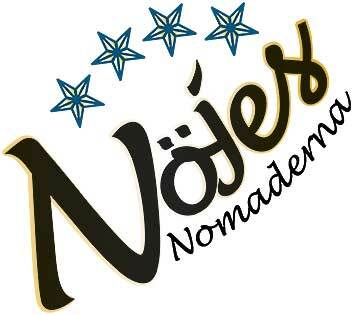 If your mind is set on a concert, a party or any other form of activity where you think NöjesNomaderna might be the answer to your questions then please contact us for further discussions. We´re seriously interested in this topic. 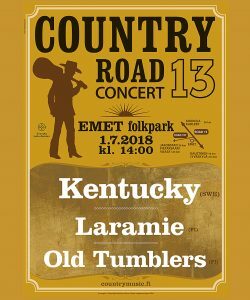 During the years 1978 – 1997 an outdoor event known as Country Road 13 was held at lake Emet Finland. This festival counts among the biggest country happenings in Finland. In the summer of 2017 a revival of Country Road 13 festival was held at the original surroundings. 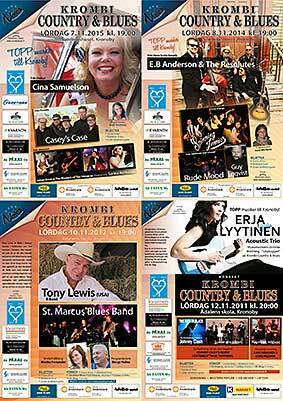 An event in Kronoby that cares for the legacy of Ostrobothnian country music. An intimate and informal small scale venue with national and international acts. 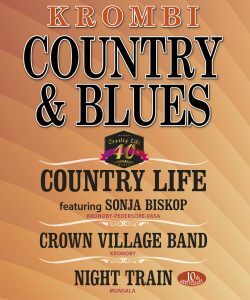 Krombi Country & Blues continues where former events Crown ´n Country, Town ´n Country and Country Road 13 left off. Since 2009 – returning November 12th 2016. Music Café POLARIS is an event for those of you that like good food and nice entertainment. Among the acts we find both established artists and bands as well as newcomers. Music Café POLARIS provides a laidback atmosphere where the music is highlighted at ”human hours”. Easy West is a countryband from the finnish west coast based in Kronoby. These veterans have a total of over two centuries of stage experience. The members of Easy West are seasoned musicians and without any stress, rush or need to show off their laid back music has evolved into something that they call ”campfire country” or ”cowboy schlagers” in which the repertoire consists of songs focusing on storytelling. 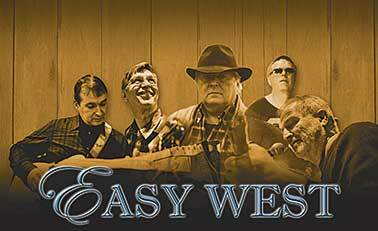 Easy West: Bengt Huhta, vocal; Jan Granlund, vocal, guitar, mandolin and harmonica; Pekka Viitala, vocal, guitar, dobro and steel guitar; Christian Lunabba, drums; Börje Nylund, bass. Country Life was founded in 1977 and is hereby one of the oldest of the present day Finnish country bands. In their heyday in the 1980´s and early 1990´s Country Life was performing frequantly at some of big country events all around the Northern countries. The band was also backing European and American artists on their tours in different parts of Scandinavia. Country Life: Rejd Nylund, vocal and acoustic guitar; Henry Riihimäki, electric guitar and vocal; Peter Nylund, steel guitar and vocal; Peter Edström, drums; Börje Nylund, bass. The Bakersfield Sound with it´s timeless classic twang is one of country music´s most familiar sounds and according to many people it´s down to earth approach makes it the only ”real country music”. 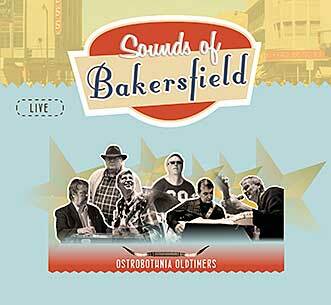 Ostrobothnia Oldtimers performs the best known songs of the Bakersfield sound with the greatest respect for the originals. Sounds of Bakersfield takes you on a musical trip in the footsteps of country music legends Merle Haggard och Buck Owens.